Happy Halloween! 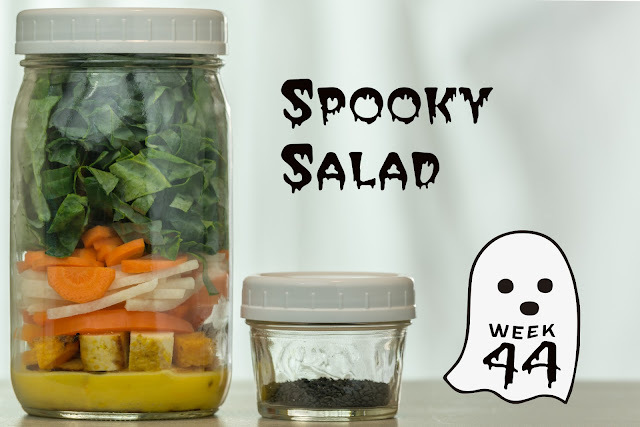 For those that celebrate, I thought a "spooky salad" was in order this week - something cute and theme-y, but still nutritious. Offset all of those treats with this salad - I promise it's not a trick! Make the sesame orange vinaigrette: combine the orange zest and juice, oils, mustard, agave, and salt in a pint-sized mason jar or other tall container. Puree and emulsify the dressing using a handheld stick blender. Marinade the chicken: add 1/4 c of the dressing to a quart-sized ziplock bag; add the chicken thighs, seal, and toss the chicken to coat with the dressing. Marinade for 20 minutes or more. Grill, broil, or roast the chicken thighs. Cool, then dice the chicken. Pack the salads: divide the remaining dressing evenly among each of 4 tall quart-sized containers. 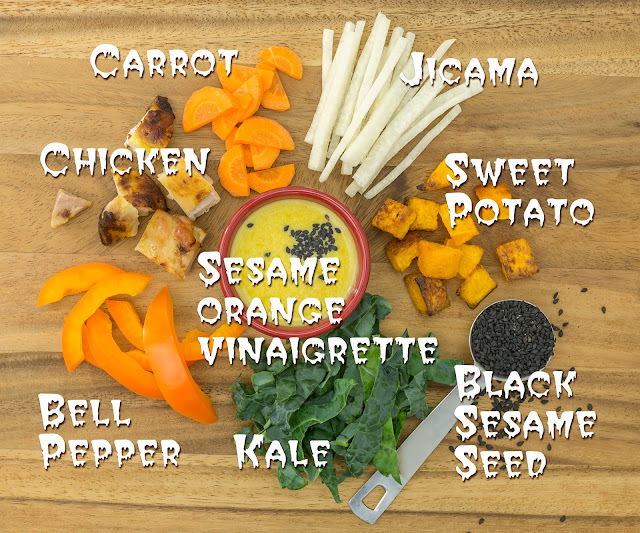 Layer the chicken, sweet potato, bell pepper, jicama, carrot, and kale in the jars. Divide the sesame seeds evenly between 4 2-oz jars or snack-size zip-top bags for each salad. Refrigerate until serving. Enjoy your salad: invert your salad onto a plate or into a bowl. Top with sesame seeds. TIME-SAVING TIPS: Use pre-washed, bagged baby kale in place of the stemmed, shredded kale. SPECIAL DIET SWAPS: This salad is gluten- and nut-free as-is. For a vegetarian/vegan salad, substitute 14 oz extra-firm tofu for the chicken thighs. Food styling, photography, and infographics by Robert Campbell. Pomegranates! I love including the beautiful, tart, crunchy seeds in all sorts of dishes - stirred into yogurt, folded into a fruit salad, and of course, sprinkled over a green salad. This simple salad, intensely green with collards and parsley, will wake up your lunches this week (and keep you full well into the afternoon as well!). Enjoy. Make the parsley-dijon vinaigrette: combine the oil, vinegar, mustard, honey, salt, and pepper in a pint-sized mason jar. Puree and emulsify the dressing using a handheld stick blender. 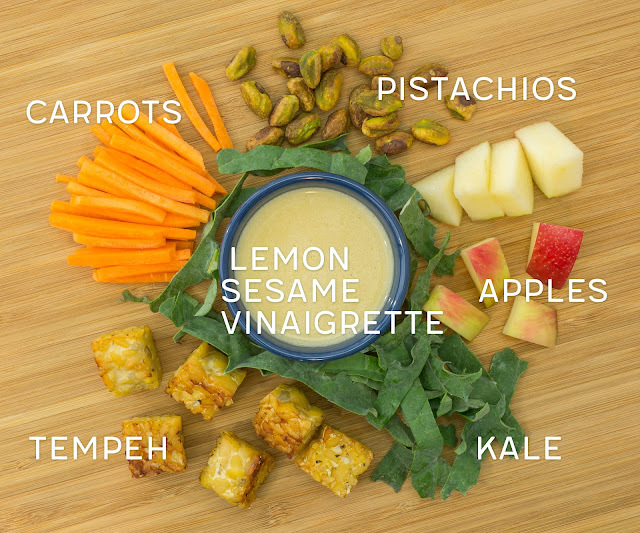 (Alternatively, puree and emulsify the dressing in a blender or mini food processor.) Stir in the parsley. Pack the salads: add 2 tbsp dressing to each of 4 tall quart-sized containers; reserve the remaining dressing for another use. 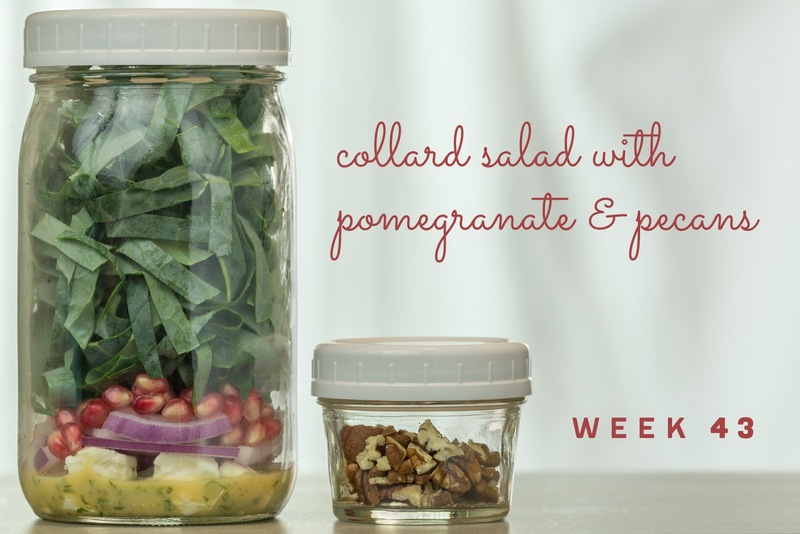 Layer the feta, red onion, pomegranate seeds, and collard greens in the jars. Divide the pecans evenly among 4 2-oz jars or snack-sized zip-top baggies, one for each salad. Refrigerate until serving. Enjoy your salad: invert your salad onto a plate or into a bowl. Top with pecans. 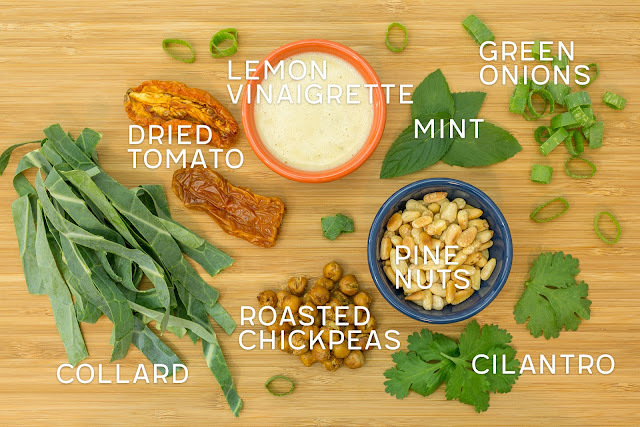 TIME-SAVING TIPS: Substitute your favorite store-bought vinaigrette for the parsley-dijon vinaigrette. Purchase fresh pomegranate seeds instead of seeding your own pomegranate. Substitute pre-washed baby kale for the collard greens. SPECIAL DIET SWAPS: This salad is vegetarian and gluten-free as-is. For a vegan salad, substitute your favorite vegan feta for the dairy feta. 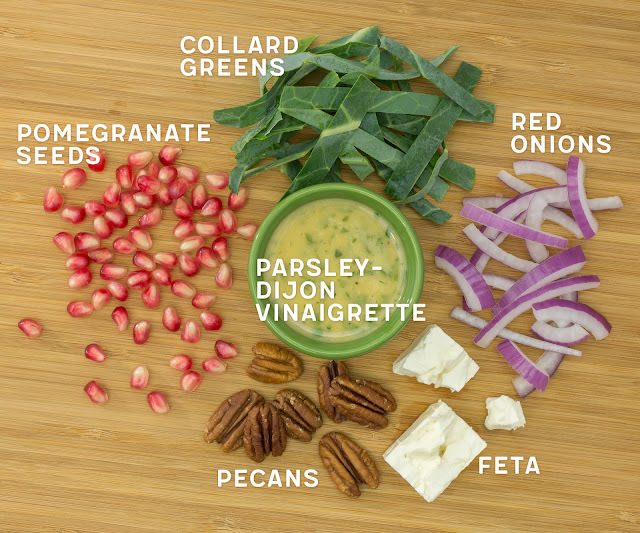 For a nut-free salad, substitute roasted sunflower seeds for the pecans. MAGIC KALE SALAD. We can thank Peas and Thank You for this amazing recipe - I don't know whether this salad make it into either of her books, but I've been guarding this recipe with my life for years. I daresay everybody who tries magic kale salad loves it - it is truly a crowd-pleaser, has become one of my go-to potluck recipes, and has made it into the standing "Christmas Dinner" menu at our house. With the addition of some grilled or broiled tempeh, it turns into a substantial, power-packed lunch! I couldn't consider a salad series without including this one, and I hope you enjoy it as much as we do! Make the lemon sesame vinaigrette: combine the lemon juice, oils, mustard, agave, and salt in a pint-sized mason jar or other tall container. Puree and emulsify the dressing using a handheld stick blender. Pack the salads: divide the dressing evenly among each of 4 tall quart-sized containers. 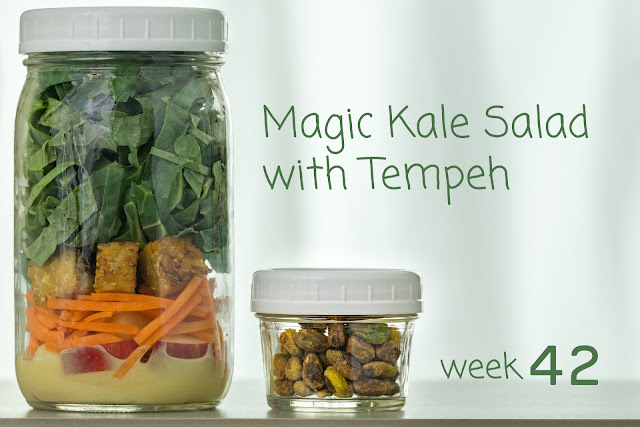 Layer the apple, carrot, tempeh, and kale in the jars. Divide the pistachios evenly between 4 2-oz jars or snack-size zip-top bags for each salad. Refrigerate until serving. Enjoy your salad: invert your salad onto a plate or into a bowl. Top with pistachios. TIME-SAVING TIPS: Use pre-washed bagged baby kale in place of the stemmed, shredded kale. SPECIAL DIET SWAPS: This salad is vegan and gluten-free as-is. For a nut-free salad, substitute salted, hulled sunflower seeds for the pistachios. Pears are a fruit I definitely don't eat often enough. It's so easy for me to get distracted by the wide variety of apples available this time of year, that I completely overlook pears! My mistake - and definitely one to correct with this salad. Pick up a couple of ripe, sweet pears and your favorite bleu cheese this week, and dig into this salad - it's a classic way to feature this oft-overlooked fruit! Make the champagne vinaigrette: combine the garlic, mustard, vinegar, lemon juice, honey, salt, pepper, and oil in a pint-sized mason jar or other tall container. Puree and emulsify the dressing using a handheld stick blender. Pack the salads: add 2 tbsp dressing to each of 4 tall quart-sized containers; reserve the remaining dressing for another use. 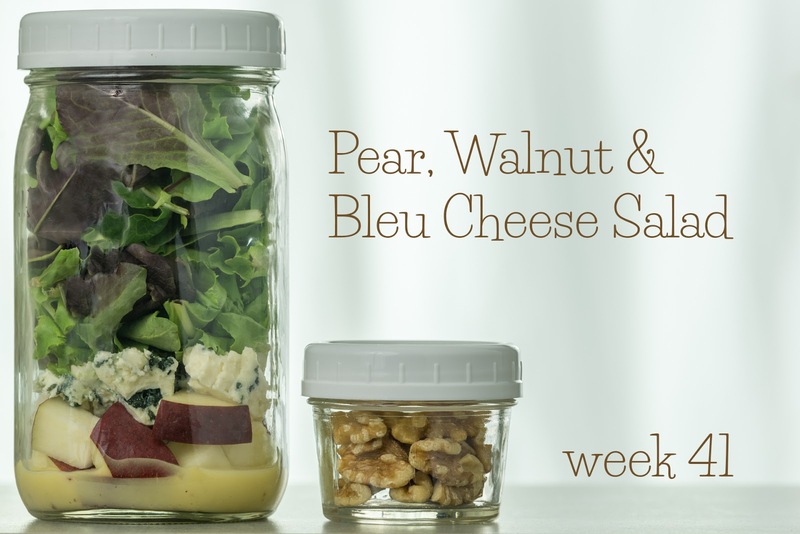 Layer the pear, bleu cheese, and mixed greens in the jars. 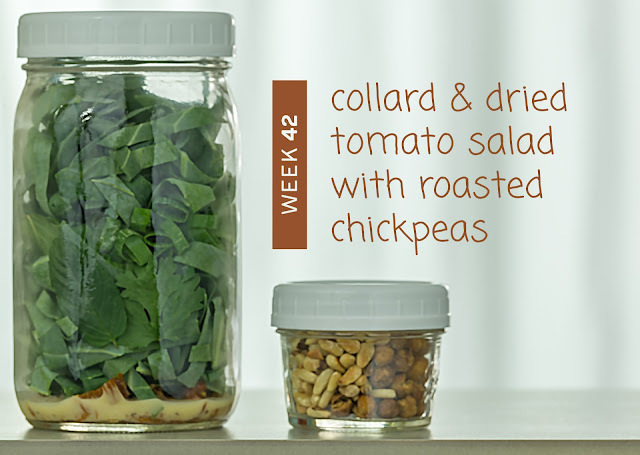 Divide the walnuts evenly between 4 2-oz jars or snack-size zip-top bags for each salad. Refrigerate until serving. Enjoy your salad: invert your salad onto a plate or into a bowl. Top with walnuts. 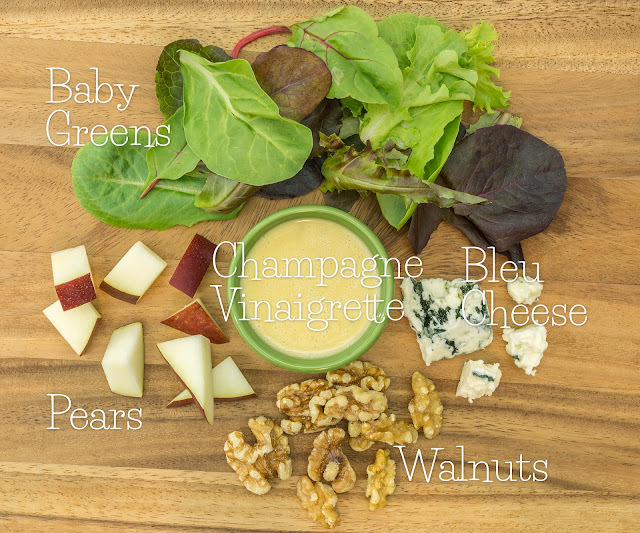 TIME-SAVING TIPS: Use your favorite store-bought champagne vinaigrette in place of the homemade dressing. SPECIAL DIET SWAPS: This salad is vegetarian and gluten-free as-is. For a vegan salad, substitute agave for the honey in the dressing, and your favorite vegan bleu cheese or cultured tofu product for the dairy cheese. For a nut-free salad, substitute sunflower seeds or pepitas for the walnuts. Last summer, we had a bounty of tomatoes in our garden - a bounty so large, I was unable to keep up with eating, canning, and freezing them, and had to explore other preservation options. Dried tomatoes to the rescue! Tomatoes are surprisingly easy to dry in a very low oven, and will store, once dried, almost indefinitely in the freezer. If you don't have your own stash of dried tomatoes, pick some up at the store this week to add rich flavor to this unique salad! Make the roasted chickpeas: preheat the oven to 350 degrees Fahrenheit. Toss the chickpeas with 1 tbsp oil, cumin, paprika, salt, and pepper. Bake the chickpeas for about an hour, or until evenly dried, crispy, and golden brown. Cool. Pack the salads: divide the dressing evenly between each of 4 tall quart-sized containers. Layer the dried tomato, green onions, cilantro, mint, and collard greens in the jars. Divide the chickpeas and pine nuts evenly among 4 snack-sized zip-top baggies, one for each salad. Refrigerate until serving. Enjoy your salad: invert your salad onto a plate or into a bowl. Top with chickpeas and pine nuts. TIME-SAVING TIPS: Substitute your favorite store-bought lemon vinaigrette for the homemade vinaigrette. Substitute store-bought roasted chickpeas for the homemade roasted chickpeas. Substitute pre-washed, bagged baby kale for the collard greens. SPECIAL DIET SWAPS: This salad is vegan and gluten-free as-is. For a nut-free salad, substitute roasted sunflower seeds for the pine nuts.